Domed metal buttons with a rim are sometimes referred to as the 'French Marine' button but were actually a common type of civilian button. Several examples of buttons very similar to these may be found on pages 59 and 60 of Gentlemen on the Frontier: A Pictorial Record of the Culture of Michilimackinac. 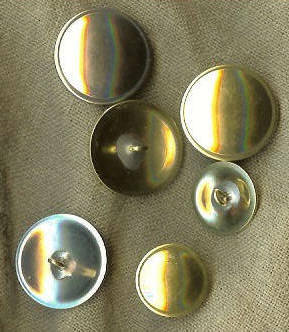 Brass was used just as often as white metal buttons. Although the alloy today called nickel or German silver was not developed until the early 19th century, many similar alloys were used. These are very high quality buttons and tend to be lighter weight than a lot of the pewter buttons currently on the market. The edges of the buttons are smoothed off and the shaft is securely soldered in place.